We pride ourselves on working with landlords, tenants, buyers and seller alike, providing a great service to each. As one of the leading estate agents in Exeter, we cover the entire surrounding area for sales and lettings, as well as property management. Providing customers with the best level of service and a completely smooth process in whatever area your property needs may be. We are proud to have our existing customers refer them to their friends and family and aim to continue achieving this level of service. If you are looking for a completely stress free, smooth and simple property service, we are sure to provide you with such. We are the first Hunters branch to open up in the South West. Find out more about the local area and houses for sale in Exeter in our local area guide. Looking to buy a house in Exeter? If so, we can help. Our team have extensive knowledge of the local area, and will assist you in finding the perfect home. There’s something for every budget in Exeter - and every style too. Whether you want to live in a city centre flat, or a suburban semi-detached property. To see a current list of Exeter houses on the market, simply click here. Anthony Thomas transformed Independent estate agent, Dennis James & Co., into the Hunters branch we see today. 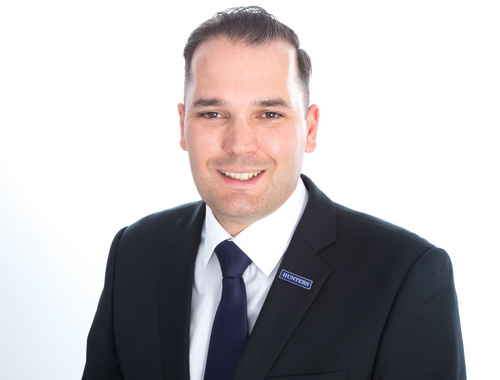 He opened the doors to Hunters Estate Agents Exeter in November 2013, offering the surrounding location the chance to receive an exceptional sales and letting service. Today, the Hunters team uses its profound existing knowledge of the property market from their previous business venture, producing one of the finest and most knowledgeable letting agents in the area. If you’re looking to sell your property, Hunters Exeter can assist you every step of the way. That includes helping you get a price your happy with. We’ll start by offering you a free valuation of your home. You can do it online by clicking here. Or, you can request that one of our team come out and do the valuation in person. Don’t worry, it’s still free - and you can get a more accurate valuation. Speak to our sales team to get started. Great service from start to finish on our property sale, always kept informed with regular updates as things changed. An excellent company to deal with. Hunters sold our house in 2 weeks. Anthony was brilliant. He was constantly in touch every step of the way until completion. He kept us informed of our buyers progress and made sure things went as smoothly as possible. Every member of the team was professional and courteous. I wouldn’t hesitate to recommend Hunters to anyone thinking of selling their home. They were outstanding. Click to view preferred suppliers for Hunters Exeter. VAT Reg No: 173 8177 82 | Registered No: 06821020 | Registered Office: 50 Cowick Street, Exeter, EX4 1AP. A Hunters franchise owned and operated under licence by Dennis James & Co Limited. This branch of Hunters is located in the south west of England, in the exciting and historic city of Exeter. Being part of Devon’s ceremonial county, Exeter is home to, and nearby some, amazing landmarks and interesting sights. The city has a wide range of secular buildings and structures, being common sightseeing locations for visitors. The ruins of Rougemont Castle, built soon after the Norman Conquest, can be visited for those interested in the town’s rich history. As well as this, it is home to The Guildhall - claimed to be one of the oldest medieval municipal buildings still in use, Parliament Street - which is one of the narrowest streets in the world, and the Wyvern Barracks – a former artillery barrack dating back to the 1800s. For those interested in the more up to date features of the city, Exeter is home to a fantastic city centre, comprised of an abundance of top-end shops, boutiques and cafes. It is as popular through the day as it is at night. The city centre has a wide range of pubs, clubs and bars for those wanting a party scene, and also is home to some delicious restaurants for those wanting a more quiet night. The area has a range of educational facilities; including a number of both government and independent primary and secondary schools. Exeter College is a further education college and The University of Exeter has been listed as one of the top 10 Universities in the UK, comprised of two attractive parkland campuses. There are also specialist facilities available for pupils with sensory disabilities, including the Royal West of England School for the Deaf and the West of England School for the Partly Sighted. Exeter has a population of around 120,000 residents and is continuously growing. In a research project by the BBC in 2012, it was shown to be one of the top 10 British cities for business, showing a huge potential for the city’s economic growth. As well as this, the city is constantly referred to as one of the nicest places to live in the UK, due to its low crime rates, good schools and a wide range of rich historic architecture. The houses for sale benefit from beautiful scenery, as well as the option for a scenic walk up the canal. As well as this, Exeter Food Market is a weekly event selling fresh and locally sourced produce for all residents and visitors, and it also hosts an annual Food Festival. If this isn’t enough, just a short drive away from Exeter is Westpoint, which is constantly hosting a huge range of events from food to music festivals, ensuring the nearby residents never get bored. Exeter is an amazing place to invest in property, so if you have any more questions or would like more information about houses for sale and rent, contact us today.